The Fairy Tale Rings are the local and specific responses to the general Objectives of the AFTS. Every second month of the year (August, October, December, February, April ) will be the time for local Fairy Tale Rings to meet at whatever day or date suits them. At that bimonthly meeting each Ring will be investigating the same fairy tale type, so that every two months a collection of material can be added to the AFTS website which will contribute to a deep understanding of fairy tales. This will not prevent anyone from contributing their research on that particular fairy tale type at whatever time suits them. To provide settings for members of the AFTS to meet regularly to explore fairy tales in Australia, wherever they may live. To deepen knowledge of specific traditional fairy tales: history, meanings, variants. To discuss the relevance of each fairy tale to Australia: land, history, people. To showcase Australian interpretations of these fairy tales, including local variants collected by members, and new works. To encourage a diversity of creative and regional responses to each fairy tale. To generate new research and creative works which can contribute to the national understanding of fairy tales once uploaded to the national AFTS website. to connect people who are interested in fairy tales so they can arrange social gatherings of interest eg fairy tale retellings in films, plays and exhibitions. AFTS member Toby Eccles, who presented a paper on Australian stories at the Conference, recently posted some fascinating links to true stories of lost children. A fascinating article in The Age and a few songs. 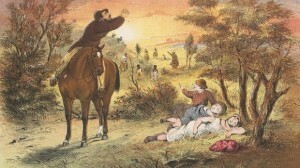 And for anyone interested in the links to the Australian folk music tradition, the song ‘Babes in the Wood’ has been recorded from the Australian oral tradition (interesting variation to the English versions of the song), and was popular as a Varsovienna dance tune in the Australian Old Time dance music tradition. The historical story of the lost children from the Wimmera may have resonated with people because of the popularity of this song, or perhaps the song/tune got popular here partly as a result of the fascination with the Wimmera story. There are English versions of the story, at least one of which is published in Katherine Briggs’ ‘Dictionary of British Folktales in the English Language’. The first link is to folk singer Martyn Wyndham-Read singing the Australian version of the song. The second and third links are to the National Library of Australia’s oral history/folk music catalogue, both with Old Time musicians playing the Babes in the Wood Varsovienna (amongst other tunes). Thanks Toby! I think a new age of Australian folk and fairy tales is dawning! !